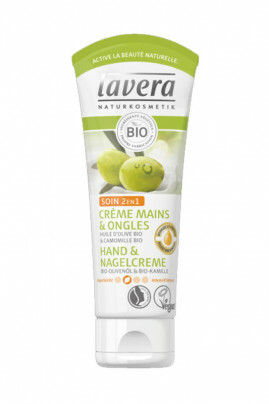 Lavera Vegan 2-in-1 Cream is a natural care that takes care of both your hands and nails. Rich in organic olive oil, this cream deeply nourishes the delicate skin of your hands while protecting your nails and cuticles. Thanks to the anti-inflammatory properties of organic chamomile, this cream is the ally of dry and rough skin. This Vegan 2 in 1 Hand & Nail Cream penetrates quickly without leaving a greasy film. It envelops your hands with a delicate perfume that reminds us of Provence. This vegan care offers your hands softness and hydration, even after several hours. Apply Vegan 2 in 1 Hand & Nail Cream regularly to your hands and cuticles as soon as you feel the need.